(iii) Cl−(CH2)4−Cl into hexan-1, 6-diamine? In C6H5NH2, N is directly attached to the benzene ring. Thus, the lone pair of electrons on the N−atom is delocalized over the benzene ring. 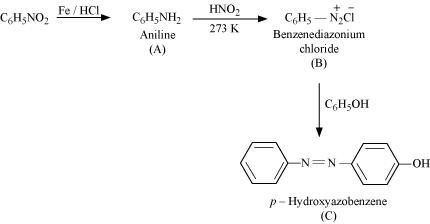 In C6H5CH2NH2, N is not directly attached to the benzene ring. Thus, its lone pair is not delocalized over the benzene ring. Therefore, the electrons on the N atom are more easily available for protonation in C6H5CH2NH2 than in C6H5NH2 i.e., C6H5CH2­NH2 is more basic than C6H5NH2. Again, due to the −I effect of C6H5 group, the electron density on the N−atom in C6H5CH2NH2 is lower than that on the N−atom in (CH3)3N. Therefore, (CH3)3N is more basic than C6H5CH2NH2. Thus, the given compounds can be arranged in the increasing order of their basic strengths as follows. 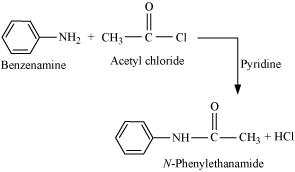 With excess methyl iodide, in the presence of Na2CO3 solution, N, N-dimethylaniline produces N, N, N−trimethylanilinium carbonate. Give one chemical test to distinguish between the following pairs of compounds. Secondary amines react with Hinsberg’s reagent to form a product that is insoluble in an alkali. For example, N, N−diethylamine reacts with Hinsberg’s reagent to form N, N−diethylbenzenesulphonamide, which is insoluble in an alkali. 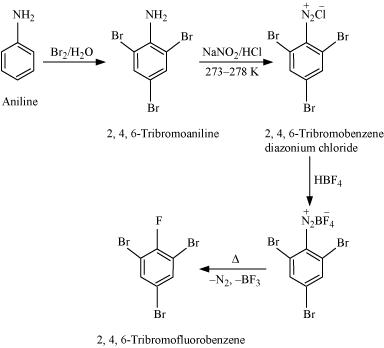 Tertiary amines, however, do not react with Hinsberg’s reagent. (iv) Although amino group is o, p− directing in aromatic electrophilic substitution reactions, aniline on nitration gives a substantial amount of m-nitroaniline. Ethylamine when added to water forms intermolecular H−bonds with water. Hence, it is soluble in water. But aniline does not undergo H−bonding with water to a very large extent due to the presence of a large hydrophobic −C6H5 group. Hence, aniline is insoluble in water. Due to the +I effect of −CH3 group, methylamine is more basic than water. Therefore, in water, methylamine produces OH− ions by accepting H+ ions from water. Ferric chloride (FeCl3) dissociates in water to form Fe3+ and Cl− ions. Then, OH− ion reacts with Fe3+ ion to form a precipitate of hydrated ferric oxide. (i) In C2H5NH2, only one −C2H5 group is present while in (C2H5)2NH, two −C2H5 groups are present. 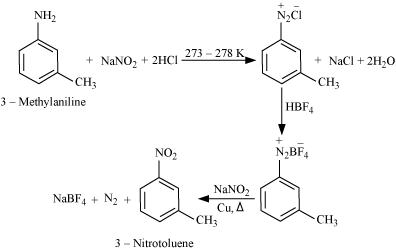 Thus, the +I effect is more in (C2H5)2NH than in C2H5NH2. Therefore, the electron density over the N-atom is more in (C2H5)2NH than in C2H5NH2. Hence, (C2H5)2NH is more basic than C2H5NH2. (ii) C6H5N(CH3)2 is more basic than C6H5NH2 due to the presence of the +I effect of two −CH3 groups in C6H5N(CH3)2. Further, CH3NH2 contains one −CH3 group while (C2H5)2NH contains two −C2H5 groups. Thus, (C2H5)2 NH is more basic than C2H5NH2. Now, C6H5N(CH3)2 is less basic than CH3NH2 because of the−R effect of −C6H5 group. In p-toluidine, the presence of electron-donating −CH3 group increases the electron density on the N-atom. −NO2 group decreases the electron density over the N−atom in p-nitroaniline. 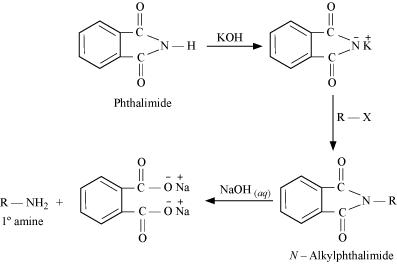 Thus, p-nitroaniline is less basic than aniline. (b) C6H5NHCH3 is more basic than C6H5NH2 due to the presence of electron-donating −CH3 group in C6H5NHCH3. Again, in C6H5NHCH3, −C6H5 group is directly attached to the N-atom. However, it is not so in C6H5CH2NH2. Thus, in C6H5NHCH3, the −R effect of −C6H5 group decreases the electron density over the N-atom. Therefore, C6H5CH2NH2 is more basic than C6H5NHCH3. (v) The boiling points of compounds depend on the extent of H-bonding present in that compound. The more extensive the H-bonding in the compound, the higher is the boiling point. (CH3)2NH contains only one H−atom whereas C2H5NH2 contains two H-atoms. Then, C2H5NH2 undergoes more extensive H-bonding than (CH3)2NH. 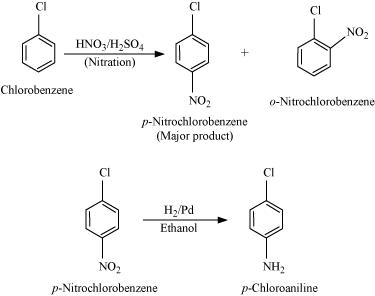 Hence, the boiling point of C2H5NH2 is higher than that of (CH3)2NH. Further, O is more electronegative than N. Thus, C2H5OH forms stronger H−bonds than C2H5NH2. As a result, the boiling point of C2H5OH is higher than that of C2H5NH2 and (CH3)2NH. (vi) The more extensive the H−bonding, the higher is the solubility. C2H5NH2 contains two H-atoms whereas (C2H5)2NH contains only one H-atom. Thus, C2H5NH2 undergoes more extensive H−bonding than (C2H5)2NH. Hence, the solubility in water of C2H5NH2 is more than that of (C2H5)2NH. 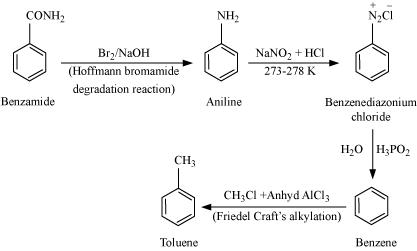 Further, the solubility of amines decreases with increase in the molecular mass. This is because the molecular mass of amines increases with an increase in the size of the hydrophobic part. The molecular mass of C6H5NH2 is greater than that of C2H5NH2 and (C2H5)2NH. 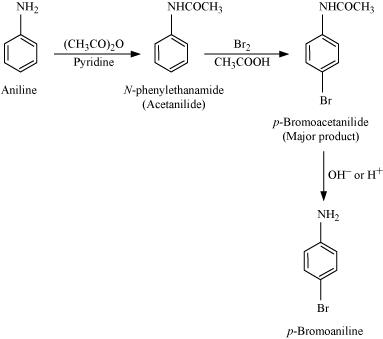 Describe a method for the identification of primary, secondary and tertiary amines. Also write chemical equations of the reactions involved. Due to the presence of a strong electron-withdrawing sulphonyl group in the sulphonamide, the H−atom attached to nitrogen can be easily released as proton. So, it is acidic and dissolves in alkali. There is no H−atom attached to the N-atom in the sulphonamide. Therefore, it is not acidic and insoluble in alkali. 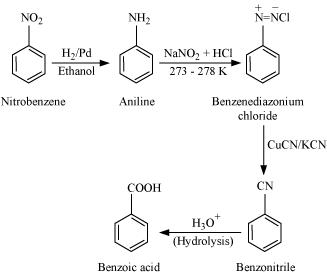 For example, on treatment with NaNO2 and HCl at 273−278 K, aniline produces benzenediazonium chloride, with NaCl and H2O as by-products. The reaction of joining two aromatic rings through the −N=N−bond is known as coupling reaction. 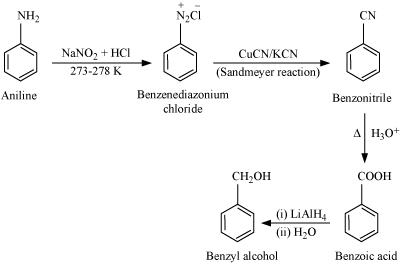 Arenediazonium salts such as benzene diazonium salts react with phenol or aromatic amines to form coloured azo compounds. When an alkyl or benzyl halide is allowed to react with an ethanolic solution of ammonia, it undergoes nucleophilic substitution reaction in which the halogen atom is replaced by an amino (−NH2) group. This process of cleavage of the carbon-halogen bond is known as ammonolysis. 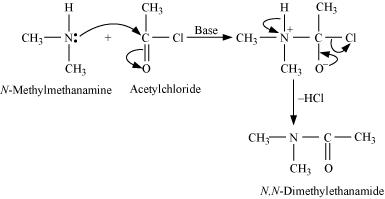 Aliphatic and aromatic primary and secondary amines undergo acetylation reaction by nucleophilic substitution when treated with acid chlorides, anhydrides or esters. This reaction involves the replacement of the hydrogen atom of −NH2 or > NH group by the acetyl group, which in turn leads to the production of amides. To shift the equilibrium to the right hand side, the HCl formed during the reaction is removed as soon as it is formed. This reaction is carried out in the presence of a base (such as pyridine) which is stronger than the amine. 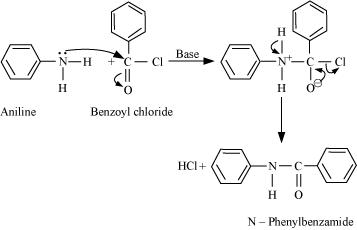 Therefore, compound ‘B’ (from which ’C’ is formed) must be benzamide, (C6H5CONH2). 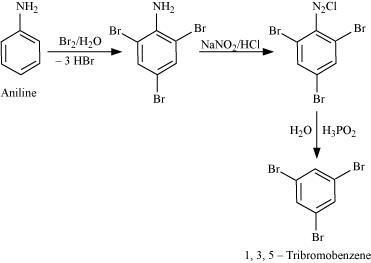 Why cannot aromatic primary amines be prepared by Gabriel phthalimide synthesis? 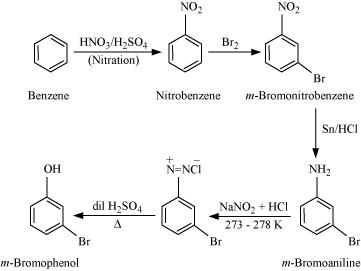 Write the reactions of (i) aromatic and (ii) aliphatic primary amines with nitrous acid. 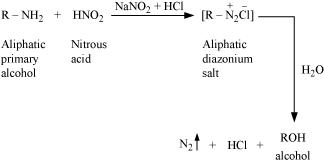 (i) Aromatic amines react with nitrous acid (prepared in situ from NaNO2 and a mineral acid such as HCl) at 273 − 278 K to form stable aromatic diazonium salts i.e., NaCl and H2O. 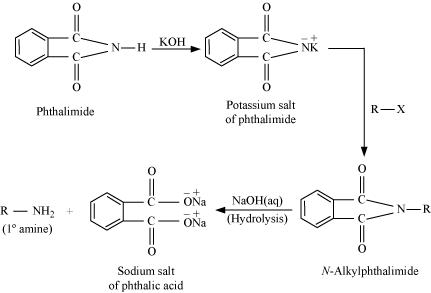 (i) Amines undergo protonation to give amide ion. Similarly, alcohol loses a proton to give alkoxide ion. In an amide ion, the negative charge is on the N-atom whereas in alkoxide ion, the negative charge is on the O-atom. Since O is more electronegative than N, O can accommodate the negative charge more easily than N. As a result, the amide ion is less stable than the alkoxide ion. Hence, amines are less acidic than alcohols of comparable molecular masses. (ii) In a molecule of tertiary amine, there are no H−atoms whereas in primary amines, two hydrogen atoms are present. Due to the presence of H−atoms, primary amines undergo extensive intermolecular H−bonding. As a result, extra energy is required to separate the molecules of primary amines. Hence, primary amines have higher boiling points than tertiary amines. (iii) Due to the −R effect of the benzene ring, the electrons on the N- atom are less available in case of aromatic amines. Therefore, the electrons on the N-atom in aromatic amines cannot be donated easily. 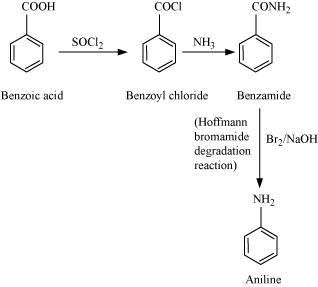 This explains why aliphatic amines are stronger bases than aromatic amines.